Will ‘creative’ and ‘hands on’ summer school foster a love of learning? These students in the Santa Ana Unified school district in Orange Country, California tackled very different challenges during their summer school programs, but they shared a common experience. Their classes were individually crafted by teachers in a first-of-its kind program for the district, in which 90 percent of students come from low-income families and about half are learning English. Noe Lopez, 7, Edward Gonzalez, 8, Sarahy Lopez, 9, and Jane Sandoval, 8, perform as Baby Bear, Papa Bear, Goldilocks and Mama Bear, respectively, during a rehearsal at Garfield Elementary’s summer arts program. The program is part of a first-ever effort by Santa Ana Unified to let teachers design summer school classes. 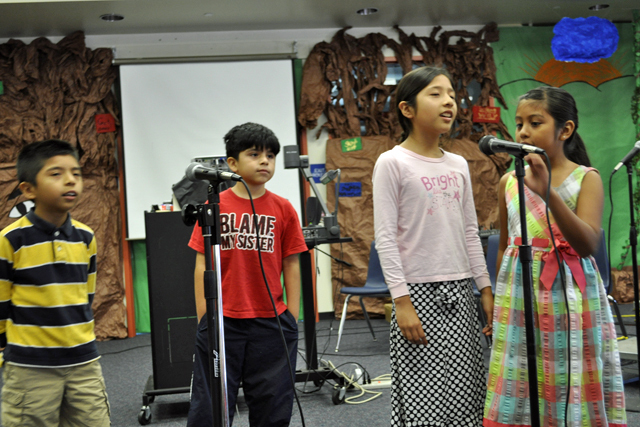 The performing arts program allowed students to sing, act, design sets, create costumes and market a production. Behind them are sets designed by students in the class. Educators wanted to create classes where students chose their own activities, worked on projects with classmates and where presentations and performances, not tests, demonstrated achievement – all with an eye to inspiring those most at risk of falling behind during the summer to learn. The result: classes that engaged 4,000 elementary and middle school students in hands-on activities such as dissecting cow eyes; handling worms, snails and pill bugs; designing theater sets and costumes and holding performances for the community; researching global warming solutions; taking field trips to zoos and museums; and delivering PowerPoint presentations on their findings. Santa Ana’s program is exciting summer learning advocates, who are campaigning for California schools to take advantage of new flexibility under the state’s revamped education funding system to funnel more money into summer enrichment. “School leaders are increasingly understanding both that summer is a time they cannot ignore and that they have to be more creative with what they do,” said Katie Brackenridge, senior director for Expanded Learning Initiatives at the Partnership for Children and Youth, an Oakland-based non-profit that advocates for afterschool and summer programs. Santa Ana administrators received more than 100 summer class proposals from teachers and selected the 53 they thought were most likely to improve achievement, especially for struggling students. That gave teachers a chance to play with learning methods central to the Common Core State Standards, a set of national instruction guidelines adopted by California in 2010 and rolled out in phases culminating this fall. Students certainly noticed the change from previous summer programs. Jocelyn Buenrostro and Christian Zaragosa, both 9, took a science class that incorporated engineering, earth science and technology. “It was really different,” said Jocelyn, who figured out which paper airplane designs ensured the smoothest landings. “Normally, in summer school I would learn math,” added Christian, who learned why cows see so well at night. 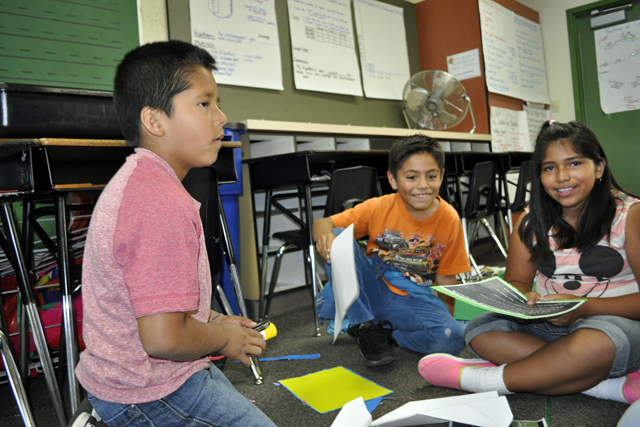 Ronald Bracamontes, 8, Christian Zaragosa, 9, and Jocelyn Buenrostro, 9, teamed up to experiment with paper airplane designs during a summer school program at Romero-Cruz Elementary in Santa Ana Unified. The team conducted nine tests on three designs to see which one generated the smoothest landings. Learning math and English is a frequent focus for school district-funded summer schools, which typically dedicate resources to helping struggling students in core subjects and providing make-up classes for those who earn Ds or Fs. California districts have had little money to do much more since 2009-10, when a state budget deal allowed recession-battered schools to use summer dollars to backfill cuts to basic services, and spending was diverted away from summer programs. Even after funding was partially restored in the last two years, many summer enrichment programs rely on federal grants for helping low-performing schools as well as private donors and state grants primarily aimed at boosting afterschool programs. For example, Los Angeles Unified, the state’s largest school district, slashed summer school spending from $43 million in 2008 to $1 million in 2013, according to Luis Mora, an administrative coordinator with the district’s Beyond the Bell Branch, which oversees afterschool and summer programs. For enrichment, Los Angeles offered programs through non-profit community groups such as LA’s BEST, which are supported by public grants and private donations, and launched a “Summer of Learning” website with a coalition of partners to link students to online education programs and community resources such as museums and aquariums. Santa Ana funded its teacher-run program with $1 million in federal poverty dollars – also available thanks to the one-year waiver – and offered make-up classes and other support for high school students. It provided an enrichment program run by the non-profit THINK Together for 3,600 students at 27 schools, supported in part by state and federal grants and private donations. The Partnership for Children and Youth says enrichment should be a component of summer programs, which researchers say are critical in helping low-income students keep up with academic requirements. A 2011 summary of research into learning loss by the RAND Corp. reported that students’ skills and knowledge deteriorate during summer, leaving them on average, a month behind where they were in the spring. All students lose some ground in math, but low-income students fall further behind in reading than their higher-income peers. 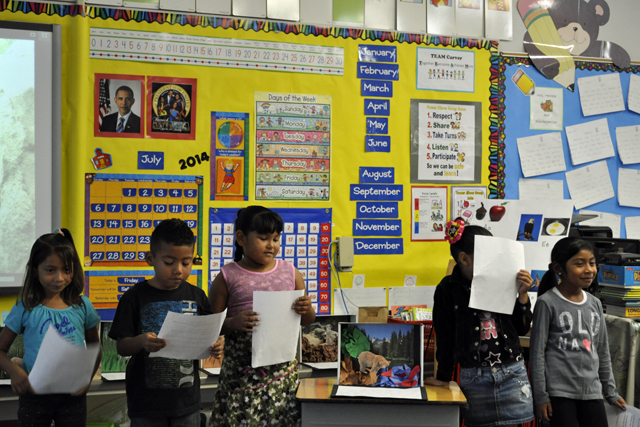 Lupita Martinez, 6, Aldo Ochoa, 6, Alison Teran, 6, Arlene Molina, 5, and Alessandra Almendariz, 6, worked as a team to research brown bears during a summer enrichment class at Carver Elementary in Santa Ana Unified. The students here are practicing oral and PowerPoint-style presentations with classmates in preparation for delivering their results to community members. The trend can be reversed if students attend academic-based summer learning programs with individualized instruction, parent involvement and small class size, according to the RAND report. But summer programs can also be expensive, highlighting the need for free programs for low-income families. Enrichment classes – which can range from science to sports activities – can help keep children engaged in the programs, added RAND senior policy researcher Catherine H. Augustine, one of the authors of the 2011 summary. The scarcity of such district-wide programs in California led RAND researchers to look to other states. In 2010, they launched a multi-year study of large urban district summer programs with academic and enrichment components, said Augustine, who is leading that study. In California, the Partnership for Children and Youth has pushed for enrichment programs since 2008 in a campaign known as Summer Matters. The group worked with 12 communities to develop enrichment models that include academic elements and emphasize project-based, collaborative learning. The programs are locally designed, funded and staffed, and vary considerably in their focus. The models include programs in San Francisco, San Bernardino, Fresno, 12 LA’s BEST sites in Los Angeles and three THINK Together sites in Santa Ana. Santa Ana’s teacher-designed program features group projects, a heavy dose of science and technology, writing and oral presentations. Carver Elementary kindergarten teachers Jill Herrera and Veronica DeBruhl created a class to give English language learners entering first grade a jump on reading, writing, listening and speaking skills. Herrera said the duo started with the idea that students would learn about animals. 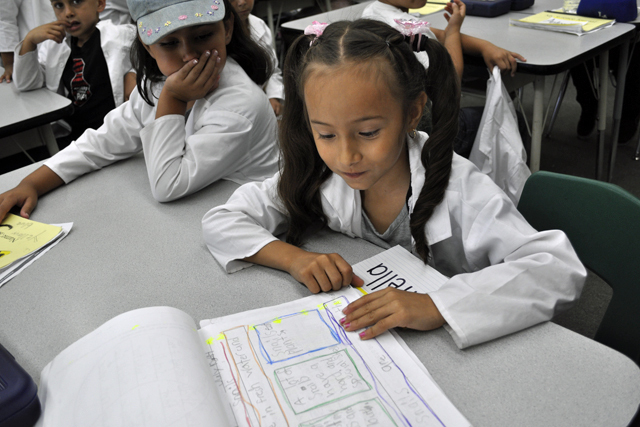 Estrella Magana, 6, clad in her lab coat, shows her lab book from a summer science class at Heninger Elementary in Santa Ana Unified. Estrella learned about snails, worms and pill bugs during the class, which included a museum field trip. They developed a class in which Lupita Martinez and her fellow students researched animals online with school supplied iPads, tracked discoveries in lab books, wrote detailed animal comparisons and depicted critters in dioramas, chalk, water color, multi-media, collages and sculptures. The students worked in groups to create hand-written and PowerPoint style presentations, which they delivered to parents and community members at the program’s conclusion. “We’ve never had the opportunity to develop our own curriculum,” Herrera said. Herrera said she believes that kindergarten students can do much more than they are asked to do now – and do it with more academic vigor. And she said her summer class proved it was true. “They can do it. It’s fun for them,” she said. At Romero-Cruz Elementary, Jocelyn Buenrostro, Christian Zaragosa and their classmates got to do experimental science. Students dissected a cow’s eye and designed their own experiments, including the design of paper airplanes. They conducted research on iPads and reported their results in end-of-session presentations. Romero-Cruz principal Kim Ahvari, who co-taught the class, said she wanted to introduce students to different science fields, including the life sciences, engineering and technology. At Garfield Elementary, principal Kasey Klappenback joined husband-and-wife teachers Jennifer and Richard Santana in running a performing arts program where incoming third- and fourth-graders, such as Sarahy Lopez, drove much of the learning. Students chose one of three projects: designing sets, creating costumes or marketing the production. Each of the three groups created their own goals and presented their plans to the other two groups for review. Every student also performed in a series of nine mini-plays in which fairy tale characters offered advice through songs and stories on how to handle life’s challenges. Maricela Castro’s daughter Kimberly, 8, played a princess in a show based on The Frog Prince. Castro said her daughter was caught up in the program, the first of its kind she’s been in, and filled the family home with song every day. Sarahy said playing Goldilocks gave her a chance to be someone other than herself. The best part? “I love singing,” Sarahy said. That’s precisely the engagement Klappenback was seeking – students learning without seeing school as something onerous. “I think it’s awesome,” he said, adding that he will organize similar performance efforts for students during the school year. RAND’s Augustine praised Santa Ana’s program for blending academics and enrichment with a focus on meeting specific student needs – such as giving first-graders a jumpstart on developing English skills. However, she also said some project-based enrichment programs don’t provide enough of an academic base, and as a result don’t succeed in improving academic performance – though they may be effective at engaging and exciting students about learning. That’s one reason why they may not be a priority for school district funding. 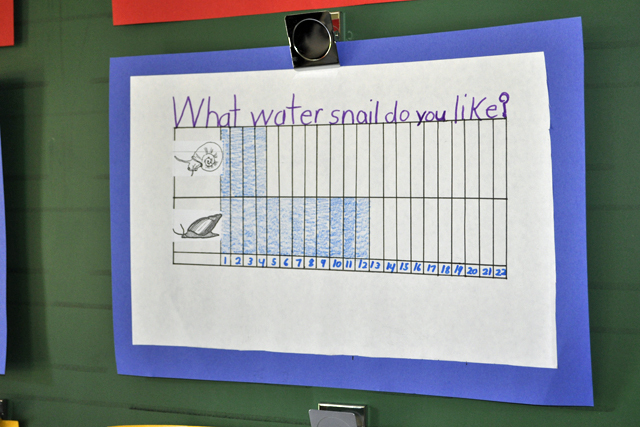 Students at a summer enrichment program at Heninger Elementary in Santa Ana created charts to track their discoveries about different animals. This one compares which types of sea snails students like the most. Brackenridge said the Partnership for Children and Youth is urging districts to try creative approaches like Santa Ana’s now that they have greater freedom over spending and increased resources. “What we want to do is take the intentionality that exists in our summer schools and the fun that exists in our summer camps and blend them, so it feels like a fun summer camp environment where kids are learning and they recognize that they’re learning,” Brackenridge said. As part of California’s new school funding system, districts have just completed plans for spending money for improving student performance over the next three years. The Partnership for Children and Youth is tracking the plans of about 50 districts, including the 30 largest and a sampling of others across the state, which has nearly 1,000 districts. About 75 percent of the draft plans reviewed by the group included summer programs of some kind. Downey Unified, a district of 22,000 with 70 percent of students from low-income homes, is one of those. Before the recession, Downey offered a traditional elementary and middle school summer program focused on math and literacy in addition to its remedial programs, Superintendent John A. Garcia Jr. said. But the district killed its elementary and middle school program during the recession and began offering a fee-based program through its adult school. District leaders met in fall 2013 with community members and Partnership for Children and Youth representatives, who described the group’s Summer Matters effort. That galvanized the district to set aside $100,000 in state funding to plan a project-based, hands-on summer program for 2015 in partnership with the city of Downey and the local YMCA.